Strabismus (crossed eyes) is caused by a lack of muscle coordination between the eyes, causing the eyes to point in different directions. The eyes are unable to focus simultaneously on a single point. Strabismus may result from problems with the extraocular muscles (the six muscle pairs that move the eyes), problems with neurological control of the extra-ocular muscles, neurotoxins, blindness, mechanical problems in the eye, or mechanical obstruction to vision in one eye during early life. 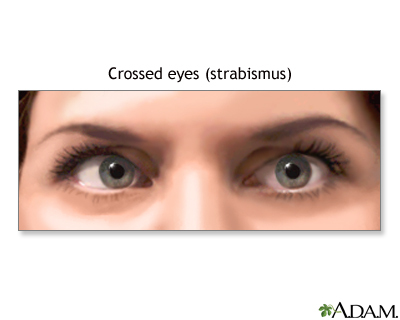 In adults, strabismus may be a symptom of various brain disorders or systemic diseases. Surgery may be recommended when strabismus does not respond to medical or optical treatment.